I was called to the Ontario Bar this month, but practised overseas for 5 years prior to my Ontario call. Am I entitled to claim the new lawyer discount? No, you would not meet the eligibility criteria for the new lawyer discount. When calculating the years in practice for the purposes of the new lawyer discount, a lawyer must include in the calculation all years in which the lawyer was practising law, whether in Ontario or elsewhere, in private practice, as in-house counsel or as an employed lawyer working in government, education or in some other capacity. I was called to the Ontario Bar this summer with no private or public practice experience prior to my Call (e.g., elsewhere), so I am currently entitled to the 50 per cent rate premium discount off the base premium for the new lawyer discount. When I renew my insurance this October for next year, I will still have been practising less than one full year. What premium reduction (for the new lawyer discount) will I be entitled to? Even though you will renew your insurance in the Fall of this year, the effective date of the renewal is January 1. If, as of January 1, you will have practised less than 200 calendar days this year, you would again be eligible for a premium discount equal to 50 per cent of the base premium for next year’s insurance policy coverage. Of course, this is assuming no related program changes are made for the coming year. I was called to the Ontario Bar in January of last year, but have not been practising continuously since my Call, claiming exemption from insurance premiums for the periods when I was not working. To date, I have only practised a total of 9 months since my date of Call. I was entitled to the 50% rate new lawyer discount when I applied for insurance last year and also when I renewed my coverage for this year. 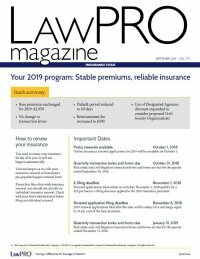 Will I still be eligible for the 50% rate new lawyer discount when I renew for next year, since I still will have less than 1 year of actual practice experience? The same discount rate options (50% off base premium, 40% off base premium, 30% off base premium, 20% off base premium) cannot be repeated for more than two policy years. As such, for next year’s insurance, since you will have already been provided with the 50% discount rate for the new lawyer discount for both last year and this year, you would be entitled to a discount equal to 40% of the base premium for the new lawyer discount. This is assuming that no related program changes are made for the coming year. I was called to the Ontario Bar in September of last year, and was exempt from paying premiums (from the date of my Call) because I was employed full-time as in-house counsel. I left that position in June of this year, and entered private practice. In completing my application for coverage, how many years in practice should I indicate on the application form? When considering years in practice, you must account for all the time spent in practice and/or public practice. As such, you should consider the time you spent as in-house counsel in your calculation. As you had less than one year of practise last year (given the timing of your call) and you were practising in-house and then in private practise for more than 200 days this year, you would indicate 1 full year in practice to date. I practiced less than 200 days last year, so I indicated zero full years in practice on my renewal for this year’s insurance. I have since gone on exemption in April of this year and I am returning to practice now, in August. I have practiced over 200 days in total, when you consider both years combined, but less than 200 days in either year. How many full years in practice should I indicate on my application today, as I apply for insurance for the rest of this year? As you have practised under 200 days last year and under 200 days thus far this year, you would indicate zero full years in practise again on your new application, as you have not exceeded 200 days in either year. Please note that the maximum number of years you can qualify for the same discount rate (i.e., 50% off base premium, 40% off base premium, 30% off base premium, 20% off base premium) is two years. I was on leave (exemption C) for all of last year. My number of full years in practice the year before was 2. How many years in practice should I indicate on my application? If you practised for more than 200 days the year before going on exemption C, you would indicate 3 years on your current application. If you practiced for less than 200 days, you would indicate 2 years, unless you have already claimed the 2 year discount in two consecutive years prior to last year. I practice only periodically each year, generally doing 1 or 2 monthly contracts per year and not practising law in between. If I read correctly, I am only able to claim the full year discount a maximum of two times for each discount level. Therefore must I indicate this year that I have 2 full years in practice, when in fact, I haven’t as yet been in practice for a full years’ time? Yes, you are correct that you cannot claim the same level of discount (50%, 40%, 30% or 20%) for more than two years in which you have been practising insured, regardless of the number of days you have been in practice. Depending on the nature of the services you provide and when you provide them, you can see premium savings by either claiming exemption when you are not providing the services of a lawyer, or you may qualify for the part-time practice option.